A fire show is the perfect entertainment choice to guarantee a day to remember. 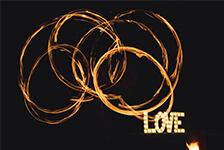 Our solo or group fire shows make a great addition to your special day and are sure to captivate your guests. 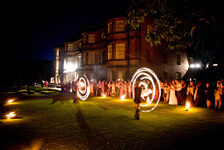 And, for that extra "wow factor", our exciting wedding entertainers offer a pyrotechnic display as the finale to the show. Meet and greet fire performers are an unusual and exciting welcoming party for your friends and family. With amazing tricks and some warm words, they are the perfect way to begin your celebrations. Even when the speeches aren't funny! Our confident and easy going entertainers ensure that whilst we concentrate on exciting fire shows and displays to thrill and amaze, you and your guests can simply relax, and enjoy. Contact us now to find out how our exciting performers for hire can set your event alight, fire up your guests, and create magical memories of your special day! We look forward to receiving your entertainment enquiry.